Small volumes of anti-ITGaX antibody vial(s) may occasionally become entrapped in the seal of the product vial during shipment and storage. If necessary, briefly centrifuge the vial on a tabletop centrifuge to dislodge any liquid in the container`s cap. Certain products may require to ship with dry ice and additional dry ice fee may apply. Western Blot: Sample: Recombinant ITGaX, Mouse. NCBI/Uniprot data below describe general gene information for ITGaX. It may not necessarily be applicable to this product. ITGAX: Integrin alpha-X/beta-2 is a receptor for fibrinogen. It recognizes the sequence G-P-R in fibrinogen. It mediates cell-cell interaction during inflammatory responses. It is especially important in monocyte adhesion and chemotaxis. Belongs to the integrin alpha chain family. 1. 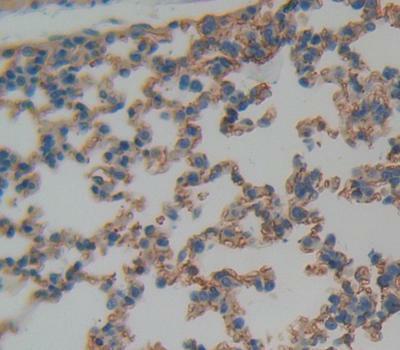 MyD88 signaling in lysozyme M and CD11c-expressing myeloid cells, as well as in pulmonary epithelial cells, is critical to restore inflammatory cytokine and antimicrobial peptide production, leading to efficient neutrophil recruitment and enhanced bacterial clearance.